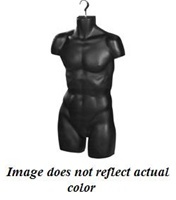 Browse our collection of male torso mannequins for sale and find an assortment of great-looking clothing displays for men that include upper, lower, and three-quarter mannequins torsos. Mannequin Depot is proud to be a quality supplier of fine mannequins at wholesale prices and offers a rich ecommerce experience for your convenience. Our customer support staff is also very helpful so if you would like to know more about our forms, give us a call during normal business hours (9-6, M-F EST) at 1-800-807-2408.